Noise Cancelling Headphones – Listen, Inc. 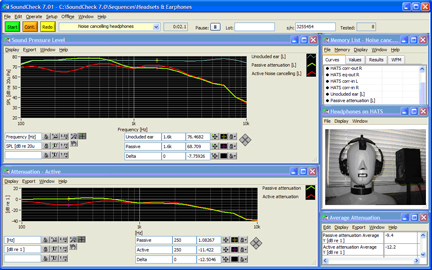 When measuring noise cancelling headphones there are three important pieces of data to generate. Passive Attenuation is the amount of noise that is reduced at the ear simply by the headphones being worn. Active Attenuation is the amount of noise that is further reduced by turning on the device’s active cancellation feature. Lastly, Total Attenuation is the combined reduction in noise from passive and active sources, and is what the end user of the product will experience. To calculate these metrics this sequence performs three separate measurements using a Head and Torso Simulator and a small speaker which serves as a noise source. The alternative to using the small speaker would be to develop a diffuse environment with multiple speakers playing uncorrelated noise. This is a far more complicated arrangement and would require additional steps in the sequence.